The Fiero from our Platinum Collection contains the essentials you will need to prepare a phenomenal barbecue feast. 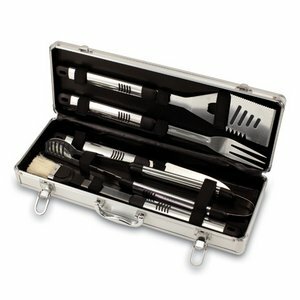 The Fiero barbecue tools set features an attractive aluminum carrying case with faux leather interior, a comfort-grip handle, and elastic-reinforced hook and loop closures to keep tools secure while in transit. It includes five aluminum-handled tools with safety thumb grips and large eyelets to allow you to hang the BBQ tools. The Fiero includes: 1 extra-large stainless steel spatula with serrated edge and integrated bottle opener, 1 large stainless steel BBQ fork, 1 large stainless steel BBQ knife, 1 pair of stainless steel tongs, and 1 basting brush. The Fiero makes a perfect gift for those who takes their grilling seriously.